Miraculins Inc. (TSX VENTURE:MOM), ("Miraculins" or the "Company") a medical diagnostic company focused on acquiring, developing and commercializing diagnostic and risk assessment technologies for unmet clinical needs, is pleased to announce five new SCOUT DS® publications in peer-reviewed journals since April 2013. These studies include research demonstrating the superiority of the SCOUT DS® system when compared to random capillary glucose in an at-risk population, published in Diabetes Research and Clinical Practice in April 2013. 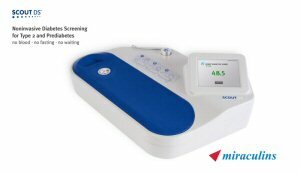 "The recent publication of a number of SCOUT DS® studies in well-respected, peer-reviewed journals, highlights the increasing scientific evidence in support of this product, the world's first non-invasive diabetes screening system," said Christopher J. Moreau, President and Chief Executive Officer of Miraculins Inc. "The SCOUT DS® is designed to provide a highly sensitive and convenient method for screening of pre-diabetes and type 2 diabetes based on the presence of diabetes-related biomarkers found in skin and we are pleased to see the supporting scientific evidence continue to build." 1. Tentolouis N. et al. Screening for HbA1c-defined prediabetes and diabetes in an at-risk Greek population: Performance comparison of random capillary glucose, the ADA diabetes risk test and skin fluorescence spectroscopy. Diabetes Research and Clinical Practice 2013: 100(1): 39-45. 2. Cleary PA. et al. Clinical and Technical Factors Associated with Skin Intrinsic Fluorescence in Subjects with Type 1 Diabetes from the DCCT/EDIC Study. Diabetes Technology and Therapeutics 2013:15(6): 466-474. 3. Orchard TJ. et al. The Association of Skin-Intrinsic Fluorescence With Type 1 Diabetes Complications in the DCCT/EDIC Study. [Published online ahead of print June 28, 2013 Diabetes Care. Doi: 10.2337/dc12-2661. 4. Olson BP. et al. Noninvasive Skin Fluorescence Spectroscopy Is Comparable to Hemoglobin A1c and Fasting Plasma Glucose for Detection of Abnormal Glucose Tolerance. Journal of Diabetes Science and Technology 2013: 7(4): 990-1000. 5. Shah S. et al. Advanced glycation endproducts in children with diabetes. [Published online ahead of print August 5, 2013] Journal of Pediatrics. Doi: 10.1016/jpeds.2013.06.044. In addition to these current publications, the clinical and scientific evidence underlying the SCOUT DS® has been developed in a number of clinical studies, across more than 30 clinical sites and over 3,000 patients. 1. ENGINE trial, a prospective, multi-centre study which was conducted in 2010 on more than 500 patients at 12 clinical sites in the United States. The purpose of the ENGINE trial was a real-world comparison of SCOUT DS® to fasting plasma glucose (FPG) and HbA1c (glycated haemoglobin) for diabetes screening, and using a 2-hour oral glucose tolerance test (OGTT) as the reference standard. FPG and HbA1c are common laboratory based diabetes tests. The study concluded that SCOUT DS® detection of abnormal glucose tolerance was equivalent to FPG and HbA1c at false positive rates that are appropriate for screening, and furthermore the sensitivity of SCOUT DS® was higher than that of FPG and HbA1c at their common diabetes screening thresholds. 2. POSSE trial, a 2012 comparison of SCOUT DS® against random capillary glucose (RCG) in a workplace screening model of more than 650 individuals in a four day period. The trial was conducted in collaboration with Blue Cross/Blue Shield of Louisiana using HbA1c as the reference standard. The study concluded that SCOUT DS® was more accurate than RCG in this setting. 3. NSEEDS trial, a 2010/2011, multi-centre comparison of SCOUT DS® against FPG and Hba1c with 2-hour OGTT as the reference standard. In addition to demonstrating equivalence or superiority to existing methods, the study demonstrated reproducibility of the SCOUT DS® and showed that the coefficient of variation (CV) of the SCOUT DS® was equivalent to FPG. 4. GREECE trial, a 2011/2012, comparison of SCOUT DS® against random capillary glucose (RCG) and the American Diabetes Association diabetes risk test (ADADRT) with a 2-hour OGTT as the reference standard. The study demonstrated that the SCOUT DS® was superior to RCG and ADADRT for detection of diabetes and pre-diabetes. 5. TCOYD trial, a 2010/2011, assessment of SCOUT DS® as an accurate tool for identifying individuals with previously diagnosed type 2 diabetes. The study demonstrated the SCOUT DS® ability to correctly identify 93.7% of previously identified diabetic individuals. The SCOUT DS® system is the first non-invasive diabetes screening system designed to provide a highly sensitive and convenient method for screening for pre-diabetes and type 2 diabetes based on the presence of diabetes-related biomarkers found in skin. Unlike current screening methods, a SCOUT DS® test requires no blood draw, no fasting, and no waiting for a lab result. The product has been used and validated in thousands of patients around the world. The SCOUT DS® has received clearance from Health Canada for commercial distribution, has been granted a CE Mark in the European Union, and is also cleared for sale in Mexico. For more information visit www.miraculins.com. Miraculins is a medical diagnostic company focused on acquiring, developing and commercializing non-invasive technologies for unmet clinical needs. A significant number of promising diagnostic opportunities remain un-commercialized because of the sizable gap between the discovery stage, when research institutions are typically involved, and the commercialization stage, when the larger commercial enterprises become interested. Miraculins has direct experience in bridging this gap. The Company's PreVu® technology is a revolutionary new coronary artery disease risk assessment technology that measures cholesterol levels in a patient's skin non-invasively, painlessly and without the need for fasting. The Company's preeclampsia program is partnered with Alere Inc., one of the world's largest diagnostic companies. For more information visit www.miraculins.com. PreVu® and SCOUT DS® are registered trademarks of Miraculins Inc. All Rights Reserved. 2013.